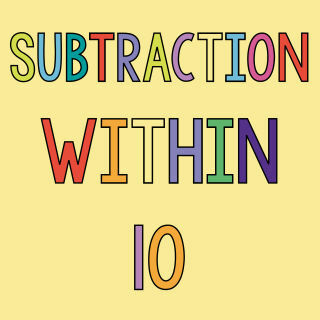 By understanding counting on and number bonds, children will already have a grasp of some of what is required to tack addition within 10. Make it real. Using similar but different objects, such as different types of biscuits (cookies), introduce number stories to your child. "If we have two chocolate chip cookies, and 3 ginger snaps, how many biscuits do we have altogether? Let's count them and see." Enlist toys or manipulatives! Give children a small number of two different types of toys or different colours of bricks, beads or counters - and encourage them to make up their own number stories. "So you have 2 red bricks? What happens if you add 2 blue bricks? How many bricks have you got now? Thread beads onto pipe-cleaners. Give your child 2 different colours of pony beads and a pipe cleaner, then give them instructions. "Can you thread 1 yellow bead onto the pipe cleaner? Now thread 2 pink beads. Count how many beads there are altogether. So we know that 1 and 2 makes 3. Or we can say "1 plus 2 equals 3". Vary vocabulary, using and, plus, equals, is equal to, is the same as, makes etc. 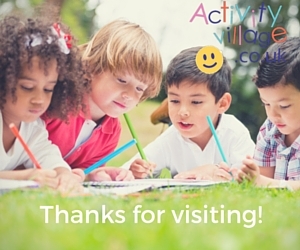 Show the children that a + sign means "and" or "plus" and that an = sign means "equals" or "is the same as". Use our Add It Up Printable (in the Resources below). This is the opposite of our Break It Up Printable and allows children to see that simple addition sums are just the reverse of number bonds. Use visual aids and displays. Look at our Addition Using Number Bond Posters and talk through and count the pictures, making number stories together and relating the sums to the number bond representations on each poster. Have a go at worksheets. You will find a set of Addition Using Number Bond Worksheets in the Resources below. Mix and Match cards. Print out our (large) set of Mix and Match number bond cards and turn them into double-sided flash cards to use for quick drills. Snap Challenge. At random times during the day call out "Snap Challenge! What's 3 plus 6?" Your child must answer as quickly as possible. The aim is for them to be able to recall instantly all the number bonds / maths facts up to 10. Encourage your child to Snap Challenge you, too. Counting on can be used for addition of 1, 2 or 3. Any more than that and it gets confusing - it can be hard for the kids to manage the numbers in their head, which is the aim. We've already done some work on counting on, so children should pick up the concept easily. Use manipulatives to show "one more". Children should already be familiar with the idea of "one more" (if not see here). Using small objects, put a number down and ask the children to count them. Add one more and ask them to count on. You can talk it through as you do. "Here we have some bricks. Can you count them? 1, 2, 3 4. Let's add one more ... 5! That means 4 plus 1 makes 5." Use number lines. Start with your finger on the first number and "hop" along 1, 2 or 3 to get your answer. Head and fingers. Some children will be able to add 2 or 3 by counting on without extra help. For those who need extra help, show children how to use "head and fingers". What is 4 plus 2? Show the child how to point to their head with their non-dominant hand, saying 4. Now count on 2 using the fingers of the other hand - 5, 6. The answer is 6. What is 4 plus 3? Point to the head - 4 - and count on 3 on the fingers - 5, 6, 7. The answer is 7. Try to do this in a rythm and make a game out of it. For example: 3 plus 2 is 3 (head) 4 (finger) 5 (finger) - with emphasis on the 5! 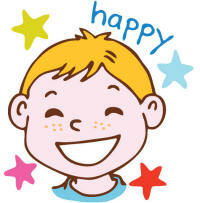 After a while you can suggest that the child "holds" the first number in their head rather than pointing to their head. Worksheets. You will find our "Addition by Counting On" worksheets in the Resources section below. 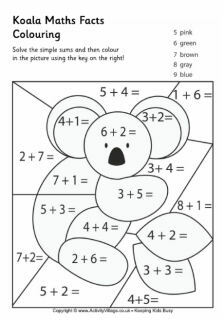 We've got a big collection of Maths Facts Colouring Pages, which make learning early addition fun!